I’ve recently installed POP_OS on my Dell XPS laptop. I want to use it to continue experimenting with open source Design applications, and other things. I want to get remote desktop access, so I can securely access it remotely over the same network. To do this I’ll need two things: to setup an SSH tunnel between the Mac OS machine (from now on called steve) and the POP_OS machine (from now on called lenny). SSH, Secure Shell, is a secure way to access Linux based computers, remotely. The connection between the client and the server is encrypted. This essentially means that someone else cannot listen in to the connection. 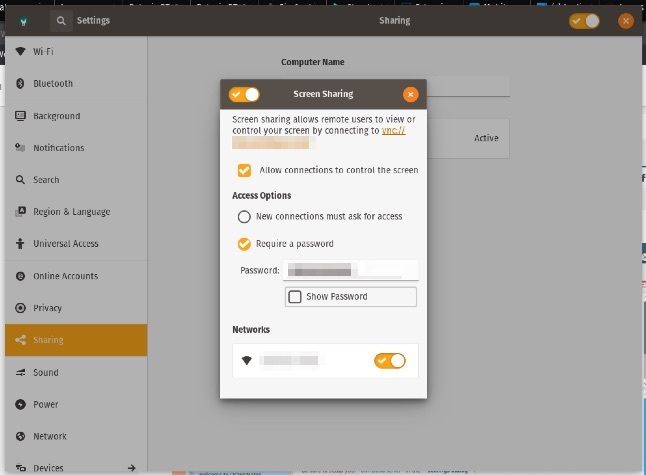 Configure SSH 1)System 76 have short instructions: https://support.system76.com/articles/server-setup/ as in the video below. There’s a nice overview video explainer 2)A nice Youtube video explaining SSH: https://www.youtube.com/watch?v=zlv9dI-9g1U of how SSH and tunnelling works. Using the great SSH tunnel application, SecurePipes, it’s easy to setup the SSH tunnel. When the SSH tunnel is created, you’ll see a little green dot beside the connection, like in the image below. This now means that a secure tunnel has been created between both steve and lenny. On steve, download the VNCViewer client from RealVNC (the inventors of the VNC protocol!). It works really nicely. Enter the “Local bind address” IP address and port from fig 2 above to make a new connection. Every time I tried to connect to lenny (and any Ubuntu machine in the past), I got ‘Unknown authType 18’ error message. 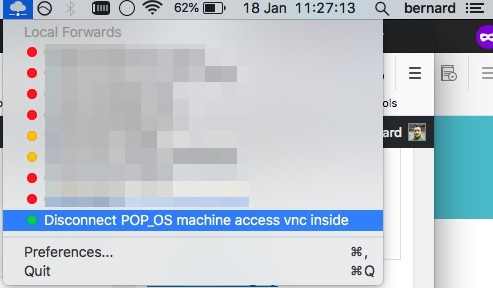 In the VNC Viewer client I tried allowing the connection encryption to be negotiated by the VNC server (Encryption: Let the server choose). It failed. I’ve tried a number of other parameters. It failed. The solution to the above error message is to disable encryption on the VNC server. This disables encryption on the VNC server. I still can’t understand why the parameter “let the server choose” does not work as disabling encryption should be the eventual outcome. Once you explicitly disable encryption on the server, as above, VNC will then work. 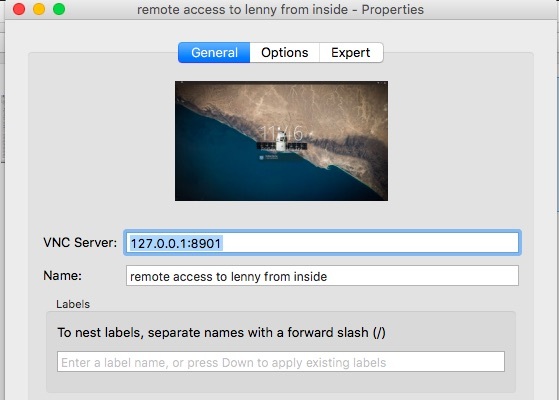 Since you are connecting to lenny the POP_OS machine through a secure SSH tunnel, the unencrypted VNC connection is no longer a concern. 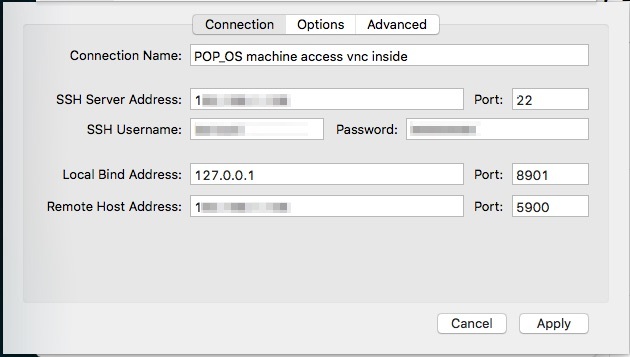 This will give you secure, remote desktop access to the POP_OS machine. You will be able to use it as if you were sitting in front of it.